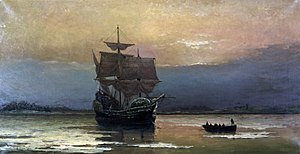 The Mayflower was the ship that in 1620 transported 102 passengers, including a group of people seeking religious freedom. Their original destination was the Virginia Colony but they were forced to land instead at the Cape Cod hook. Their story is one of suffering and survival in a harsh environment. The voyage is one of the most famous in early American history. The Mayflower left England with the ship Speedwell on 15 August 1620. It carried Pilgrims from England and Holland. The Speedwell turned out to be unseaworthy. Both ships were twice forced to return to England. The Mayflower finally left Plymouth, England on 16 September 1620. On 19 November 1620, they spotted land. Their destination was the Virginia Colony but the ship was damaged so were forced to land Cape Cod on 21 November. They wrote the Mayflower Compact, which made rules on how they would live and treat each other. Wikimedia Commons has media related to Mayflower (ship). This page was last changed on 8 November 2018, at 06:42.